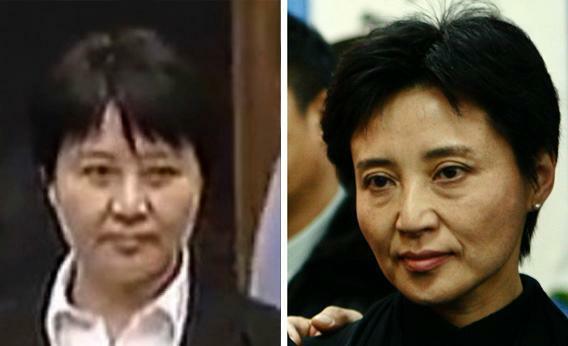 Gu Kailai trial: Chinese netizens believe that Bo Xilai’s wife has hired a body double to represent her in court and possibly serve her time in prison. Gu Kailai was convicted of murder. But was that her at the trial or her body double? Left, a screengrab from Chinese television CCTV shows the supposed body double of Gu Kailai receiving her sentencing on Aug. 20, 2012. On right, Gu Kailai at a mourning held for her father-in-law Bo Yibo in Beijing Jan. 17, 2007. Photographs by AFP Photo/CCTV; Stringer/China/Reuters/Newscom. A year ago, Chongqing party boss Bo Xilai had it all. The rising Chinese political star appeared to be on the cusp of joining the country’s most exclusive club: the nine-member Standing Committee of the Communist Party’s Politburo. Last February, however, the chief of police in his city took refuge in the U.S. consulate, bringing with him a remarkable story: that Bo Xilai’s wife had murdered Neil Heywood, a British businessman. Now Bo has been stripped of all political positions. His wife Gu Kailai, in perhaps the most anticipated show-trial since the prosecution of the Gang of Four in 1981, received a suspended death sentence for the murder charge. For Bo Xilai, it has been the best of times and the worst of times—and just like that Dickens novel, everything might end up with a body double receiving the death sentence. Earlier this month, Slate reported how China’s rich and powerful can hire body doubles to stand in for them at court and in prison. China’s tradition of substitute criminals—and even substitute executions—dates at least as far back as the mid-1600s, when the early Dominican missionary Domingo Fernandez Navarrete expressed shock at the “ease and frequency with which wealthy convicts hired proxies to suffer punishments on their behalf.”* To put it another way, this practice, called ding zui in Chinese, has flourished in China for longer than the United States has existed. One viral rumor, remarkably detailed in its allegations, displays side-by-side images of the woman in court and Gu, together with the headline: “Huge News: The woman who is the body double for Gu Kailai is a roughly 46 year-old Langfang resident named Zhao Tianyun.” A subheading urges the public to work together through crowd-sourcing to solve the body double mystery. Several paragraphs then describe how the author supposedly learned from a friend working in the Chinese government that Zhao Tianyun was Gu’s body double, and that the real Gu is still living in Beijing. Apparently to prevent this message from spreading, the Chinese government has blocked all searches for the term “ti-shen” (body double), a phrase appearing within this message, as well as searches for the name Zhao Tianyun. While China certainly has substitute criminals—the media occasionally reports arrests of some would-be substitutes—it is difficult to estimate the frequency of the practice. With ding zui, the whole purpose of the crime is to prevent people from knowing it has even occurred. Since the only known instances of ding zui are those that have been solved, it is difficult to know whether it is a frequent crime rarely discovered or whether it is a rare crime frequently foiled. Further complicating things, wealthy and powerful families who can arrange criminal substitutes seem unlikely to be exposed by the police, government officials, or media. Why would Chinese authorities allow a body double to be used at all during a closely-watched, internationally broadcast court hearing? Despite her crimes, the Bo family has tremendous clout. A body double might be permitted to protect Gu from even the minor indignity of attending a court hearing. Gu’s supporters speculate that Communist Party officials could have insisted on a docile stand-in to prevent Gu from being able to speak out in court. On Aug. 19, the Financial Times published an article on the Gu Kailai case which included the brief and tantalizing sentence, “Two security experts familiar with facial recognition software said the person shown in state television footage of the courtroom was not Ms. Gu.” While the expert opinion cited by the Financial Times garnered a lot of attention, some critics pointed out that the experts did not indicate that they had actually conducted an analysis, and instead appeared to be offering their personal opinions. So what are we to think? Was it really Gu Kailai in the dock or not? We wanted to have an independent expert conduct a proper analysis, so we turned to Dr. Behnam Bavarian, the Managing Director of AFIS and Biometrics Consulting, and a recognized expert who has testified on facial recognition. Dr. Bavarian examined known photographs of Gu, as well as images of the woman who appeared as Gu in court. His analysis involved reviewing the “landmarks” in the face, and performing mathematical calculations to determine whether or not the compared faces fall within the range of a possible match. Dr. Bavarian used a method of analysis that he has helped develop for homeland security projects, in which images captured on video (which tend to be of poorer resolution) can nevertheless be compared to other known images of the suspect. That probably won’t satisfy millions of suspicious Chinese netizens. But then again, they have been lied to so many times, who can blame them for seeing double? Correction, Aug. 24, 2012: This article originally described Domingo Fernandez Navarrete as a Jesuit missionary. He was a Dominican missionary.